It may not feel much like summer but in the airports of Europe it is very clear that the holidays are upon us once again. Terminals and flight paths are clogged but the weather is on holiday somewhere else because across Europe it has been miserable. For Formula 1 mid-July used to mean Silverstone but it is now part of what we call The Schnitzel Season, a string of races in countries where it is safe to be a sheep because they eat only schnitzels or schnitzels. The wine makes you wince, the salads are watery and the race fans all seem to think that wearing red hats and drinking a lot of beer is the cool thing to do. The F1 circus will be schnitzelling for the next six weeks in Austria, Germany and Hungary. Then it will be off to Belgium which has the red hats and the beer but where the food is a lot better. The European season is almost over for after Spa there will be a quick stop in Monza and then it is off to end the season in the United States, Japan and Malaysia. Austria used to be one of F1's favorite race meetings but it is not so nice these days. The track is not the majestic Osterreichring but rather the twiddly A1 Ring. Hotel rooms are fought over by everyone, but the chosen few have to travel long distances to find rooms which have bathrooms and telephones attached. The scenery is lovely but it is not so nice when everything is obscured in cloud. The weather was a major factor as the teams gathered. It was going to be unsettled all week but what would it be doing on Saturday and Sunday? Temperatures were an issue because of the question of tires. Tires would be key to the result because Ferrari and McLaren are so closely matched that the difference can be made by ensuring that the chassis is set up to work with the tires. Having said that, at Magny-Cours two weeks ago, McLaren and Ferrari went head to head on the same tires and it looked like the McLaren is a slightly better car in terms of traction and mechanical grip. The battle for pole position in Austria was between the two teams and it was something of a surprise to see Mika Hakkinen, a man who has been completely overshadowed in recent races by his McLaren team mate David Coulthard, taking pole position by nearly four-tenths of a second. Hakkinen was keen to tell everyone that his problems of late have been technical and that the problem is now solved but somehow it did not ring true. Hakkinen did, however, admit that he had needed a little holiday "to get my act together". It sounded plausible but one had to take into account the fact that Coulthard's qualifying session was not as successful as it might have been. "I didn't get the first corner right," he admitted. "I lost almost two-tenths by the time I got to Turn 2 and then I had to gain that back, plus a little bit more and I didn't manage to get it right on that crucial lap. I am not too disappointed." If all had gone well David felt that he would have been right there with Hakkinen. He wasn't so it was not really a relevant point. There was a bit of a surprise at Ferrari as well with Michael Schumacher being beaten by Rubens Barrichello. And it was not just in the qualifying session. Barrichello was faster throughout the weekend. Rubens did not know why. "I particularly like this track and I think I found a really good set-up for the car," he explained. "I have been calm all weekend. Just like Mika, I also had some good time off last weekend and so I am relaxed and in a good mood. Everything is going right for me at the moment." Barrichello reckoned that his car had the potential to be on pole position if all had gone well. Schumacher spent a lot of time trying to decide whether to go with the harder or softer Bridgestone tires. In the end he went soft but he found the car handling badly in qualifying trim and had a spin and several big slides. "I am quite a way off pole position," he said, "and that worries me a little. I have not been able to find the right balance between the slow and quick corners and that is very important at this track." Michael did not seem to think that he would be in a position to challenge on Sunday, but in racing you never know. "I hope to make up a few places at the start," he said. Behind the two big teams, there was a lively battle for fifth place but it was six-tenths behind Schumacher. There were four cars covered by a couple of hundredths of a second and everyone from fifth place to nineteenth were covered by seven-tenths. The men with the edge appeared to be those with Honda engines. Jordan did not have its new version of the car that had been planned but this did not stop Jarno Trulli beating the new development BARs of Jacques Villeneuve and Ricardo Zonta. Heinz-Harald Frentzen would probably have been up there as well but he took the decision to run with the slightly harder tires and so was four-tenths slower than Trulli. And that meant 15th on the grid. Jordan played a dangerous game at the start of the qualifying session when everyone else rushed out to get a time in the bank. Jordan held fast. It was not going to rain. They were correct and so at the end of the session the Jordans had an extra run in hand. The result was that Jarno had a clear track and he used it to good effect. "It was a brave decision," said Jarno, "but it was the right one." Frentzen used up all his laps in the first half of the session because he thought the end of the session would be ruined by rain but the rain stayed away and so he was unable top take advantage of the track at the end of the session. Frentzen's decision to use harder tires was taken because the car was too difficult to control on the softer compound. BAR had Ricardo Zonta and Jacques Villeneuve sixth and seventh on the grid. A good effort. Beating Villeneuve was good for Zonta's confidence but Jacques felt that he would have been faster if he had not gone for a four-lap run at the very end of the qualifying session. Giancarlo Fisichella was eighth in his Benetton but he felt he could have done better. But the fact is that Fisichella made a mistake on his first run and then had to back off because of a yellow flag on his final try. He reckoned that he should have been fifth. Local hero Alexander Wurz was down in 14th and struggling with the car as he has done all season. The midfield is so tight that a tenth of a second would have put him up three places. Mika Salo also showed quite well in what is effectively Red Bull's home race and with the Finn ninth and Pedro Diniz 11th the team finally began to look like a team using Ferrari engines. Both men had spins in the qualifying session but it was a lot better than usual. "This result is very important to us," said Peter Sauber. "The Sauber-Petronas C19 has taken a step forward and that is the result of a combination of small things." The Arrows A21 seemed to suit the track and both drivers did quite well with Jos Verstappen 10th and Pedro de la Rosa 12th but de la Rosa in particular felt he could have done better. "I was expecting to improve on my last run and I didn't," he said. "The car is fine but the conditions were tricky." Significantly both Arrows were on the harder tire compound. Prost was surrounded by rumors about the future but this disguised the fact that the cars were looking a bit better. Nick Heidfeld was 13th despite gearbox troubles but Jean Alesi was down in 17th and not at all happy with his car. Jaguar Racing was in trouble with Eddie Irvine disappearing off to London on Friday night with abdominal pains which were so severe that he could not continue driving. His place was taken by Luciano Burti, his helmet and overalls being flown down overnight. He was always going to struggle and was not helped by gearbox trouble and so ended up 21st on the grid. Johnny Herbert was 16th but he would have been a lot better if a bolt on his rear suspension had not come undone and ruined his final qualifying run. These things should not really be happening. The Williams team had a weekend from Hell. Ralf Schumacher complained about a lack of grip and never looked very quick. He was overshadowed throughout by Jenson Button but the youngster had an engine problem with just a few minutes to go and had to go to the spare car for a last minute dash. It was no good. On his earlier runs Jenson had been close to the top 10 and he reckoned that it would not have been impossible if the engine had not been making horrible noises. "It was really annoying," he commented. The fact that he had outshone Ralf Schumacher was noted within the team. At the back, split by Burti's Jaguar, were the two Minardis. Marc Gene was ahead of Gaston Mazzacane. ON Sunday morning the weather was patchy. It might do anything. In the warm-up Barrichello was fastest ahead of Coulthard and Hakkinen with Verstappen fourth quickest. Michael Schumacher was fifth. There were signs of (much-needed) improvement from Williams with Ralf Schumacher eighth and Button 11th. The pre-race recognition laps saw drama from F1 debutante Burti as his Jaguar suffered a water leak. He would have to start from the pits in the Jaguar spare car. Michael Schumacher also decided that he preferred to race in the spare. It didn't really matter because Michael's race ended at the first corner. It was not so much one accident but a series of shuntlets resulting in a fair old mess but it was not enough for a red flag. Coulthard made the better start but he was on the dusty inside line on the run down to the corner and, unsure how much grip he would have when braking, he braked earlier than Hakkinen. The Finn took the lead. "Mika had the advantage because he was on the outside," David explained. "Sometimes you have to accept it because you can't brake as hard and as late on the inside as you can when you're on the outside line. It's as simple as that." Behind them things were rather more complicated. Where does one begin? As everyone was approaching the first corner Pedro Diniz found Jos Verstappen's Arrows in front of him. Pedro must have been looking elsewhere because this seemed to catch him unawares and he braked hugely. The back of the car went away from him and slid across the road into Fisichella's Benetton, which was minding its own business on the inside. More of these two later. Meanwhile Trulli and Zonta were so busy trying to outbrake each other that they appeared to forget to brake for the cars in front of them. Jarno slid into the back of Barrichello and Zonta bumped into Schumacher. Rubens bounced onto a curb, Michael spun. Jarno then ran into Schumacher's right front wheel. The suspension was broken. The drivers arriving at the scene now had a choice to either go right or to go left because going straight on would result in disaster. The two Saubers tried to claim the same piece of road and touched, Salo getting away with it but Diniz spinning. Thus it was Mika Salo who popped out of the carnage in third place. Having started ninth he was somewhat surprised. "I couldn't believe it," he remarked. While the Saubers were tangling, the BARs were trying to do the same as they both went around the outside of the Schumacher-Trulli road block. Jacques got back on the road faster than Ricardo. Verstappen tried to go inside but found that de la Rosa was already there and made contact with Trulli's car, breaking his front wing. The two Arrows emerged fourth and fifth. Verstappen was hoping that the race would be red-flagged and stayed out for an extra lap before pitting for repairs. Those of the left side of the grid were all taking to the gravel and so Frentzen and the two Prosts pelted each other with stones, while Ralf Schumacher decided to stay on the road, bumping into someone and knocking the front left of the car awry. Those on the right slalomed through the road blocks. Wurz had got himself into a bit of a pickle with slewing chassis to the left and right and so the sixth man to exit the first corner was Herbert from 16th place on the grid. Button followed him through while Barrichello and Frentzen were able to rejoin the tarmac before Gene overtook them both. Then came Wurz, Mazzacane, the two Prosts with Heidfeld ahead of Alesi, Villeneuve, Burti and Zonta. Trulli and Fisichella obviously thought there would be a red flag and ran off back to the pits but Schumacher did not hurry. He tried a three-point turn and then it became clear his suspension was broken. There was no need for a red flag. The marshals were very quick and efficient. There were a few moments of decision up in race control and then the Safety Car was sent out. It was not really needed and at the end of lap two it peeled off into the pits and the race was on again. Well, McLaren has an unspoken understanding that he who emerges ahead from the first corner stays ahead unless mechanical troubles intervene. It happened last year at Spa when Coulthard won and it happened in Austria. This time Mika won. Coulthard spent the rest of the afternoon pottering around behind the Finn. Towards the end of the race he got bored and set the fastest lap so that everyone knew that he could have done more. Hakkinen set a bunch of fastest laps in the early laps and then received a signal from the pits which said "Revs". This was followed by another which said "Shift Rev"
"It means that there is no point in revving the engine to maximum RPM, Hakkinen explained. "At that point I didn't exactly know whether there was a problem, or whether they were just showing me there was no point in pushing." Coulthard admitted that he was happy to settle for six points as he is now within six points of Schumacher in the World Championship and he is still two points ahead of Hakkinen. And so McLaren finished first and second. Michael Schumacher was not delighted about his fate but he has often been lucky and this time the cards fell against him. "It is a shame for me and the team," he said. "Ricardo [Zonta] overestimated his own abilities and underestimated his speed but I am sure that there was nothing intentional about his actions. I have made mistakes in the past and I am sure he will admit it was his fault." With Schumacher gone Barrichello ended up third - which was where he should have been given the circumstances - but it was not an easy afternoon for him. After the first corner incident he was eighth and his car was damaged. He was quickly able to deal with Button and then Herbert. It took only a few more laps before he was ahead of Salo but there was nothing he could do to make an impression on de la Rosa. "The car was undriveable until I came in for the pit stop," he said. "Then we were able to make a bit of an adjustment." In fact by the time of the pit stop Barrichello was third anyway as de la Rosa had disappeared with a gearbox failure. Verstappen's race was compromised at the first corner. He rejoined and even set the fastest lap at one point, but he went out on lap 14 with what the team described as "a loss of power". BAR's hopes of a big result were rather dented at the first corner. Zonta damaged his car on the back of Schumacher's Ferrari. He was then given a 10-second stop-go penalty for causing an avoidable accident and so dropped way back. His pit stop was long because he had a new nose fitted and then all his efforts came to nothing when his engine blew up when he was running 11th on lap 58. Villeneuve had a rather better race although he ended the first lap in a miserable 15th. The BAR engineers decided that the best course of action was a late pit stop and Jacques drove the car hard when the road was clear. He was fourth when he stopped on lap 49 but the stop was fast enough to enable him to get out just ahead of Button and so he was able to hold on to fourth place. A good effort. Button's fifth place was a remarkable achievement given the frightful weekend Williams had been having. He weaved through the chaos and found himself in the unlikely situation of having started 18th on the grid and ending the first lap in seventh place.When Arrows' Verstappen pitted he was sixth but he could offer no defence to Barrichello and Frentzen. Heinz-Harald's demise came very quickly when oil started leaking at the back of the car and HH spun off on his own lubricant on lap five. It was an imperfect end to Jordan's weekend as Trulli never got beyond the first corner accident. Frentzen's departure left Button back in seventh and he then battled hard with Herbert in his Jaguar and later the pair caught Salo's Sauber. Having the harder tires meant that Jenson could go on longer than those ahead of him and so when he pitted on lap 47 he was able to get out ahead of both Herbert and Salo. Villeneuve's extra two laps, however, meant that the Canadian was just able to get ahead when he stopped. Jenson tried to fight back but had a bit of a moment and concluded that it would be wiser to take it easy and pick up two points. "Jenson really excelled himself today," said Sir Frank Williams. Austrian Gerhard Berger of BMW called it "an outstanding race". 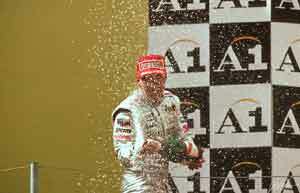 The same could not be said for his team-mate Ralf Schumacher. Having damaged his nose in the first corner kerfuffle he had to pit for repairs. The nose was changed but he then had trouble with his left front brake. He spent eight laps in the pits while the car was fixed and then set off again in a race of his own. After a spin late in the race he decided it was not worth going on. Salo's sixth place was a good effort for Sauber. After the excitement at the first corner Mika dropped to fifth as de la Rosa and Barrichello went by. But he then held off Herbert and Button until the mid-race. He had to stop earlier than his rivals and so dropped behind Button and Villeneuve but managed to stay ahead of Herbert all the way to the flag. Diniz's race was ruined by his first corner spin, followed by a 10-second penalty for causing the accident. He fought back but it was hopeless although he did manage to grab ninth from Wurz on the last lap. Benetton's race was a misery. Fisichella was out at the start and Wurz ended the first lap in 11th place. In the middle of the race he had an off and dropped two places. The final laps saw a battle with Gene and Diniz - which is really not where one expects to see a Benetton. Jaguar's weekend looked to be brightening up when Herbert emerged from the first corner fracas in sixth place. Pit stop strategy lost him places to Button and Villeneuve and so he ended up seventh. It was better than nothing. Luciano Burti did a quite impressive job given the problems he had to overcome and he finished 11th. He will be worth watching in the future. Minardi got both cars home with Gene eighth and Mazzacane 12th. It was a good effort although Mazzacane would have helped his cause if he had paid attention to blue flags and avoided a 10-second stop-go penalty. The Prost story was a sad one. Faced by a poor grid position Alesi went for a two-stop strategy. Jean did more than his fair share of overtaking but when he came up to pass Heidfeld shortly before his second stop the two collided in very silly fashion. Sad.